What are some of the fundamental ways that viewers respond to artworks? First let me make the grand announcement that no one can presume to know how each viewer will respond to an artwork. After all, there are simply too many variables that come into play with each viewer’s engagement with art. For instance, viewers have varying depths of understanding about art. They also have different dispositions, sensitivities, cognitive and physical capabilities to be taken into account. Moreover, the context and their mindset at the time of looking at an artwork make nonsense of the idea that viewers are likely to respond in the same way to an artwork. Now that I’ve exposed the essential flaw with any proposition that there might be a set of fundamental ways that viewers respond to artworks, I still wish to persevere and propose that there are four very broad ways that viewers look at, engage with and respond to artworks: a Aristotelian view (i.e. a view that an artwork is like a veil of pictorial effects under which lies essential truths); a Kantian view (i.e. a view that an artwork is like a psychological portrait of the artist who created it); a Schillerian view (i.e. a view that an artwork is enjoyed when it draws together complementary forces in flux in the viewer’s divided self); a Hegelian view (i.e. a view in which an artwork becomes a aesthetic refuge and conceptual rock upon which a viewer can rest the mind and become liberated); Proustian experience (i.e. 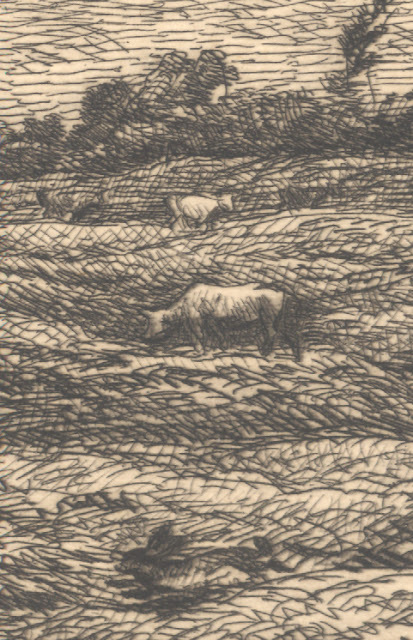 an experience in which an artwork is a catalyst for personal reverie). I realise that my version of the concepts of the above luminaries (Aristotle, Immanuel Kant, Friedrich Schiller, Georg Wilhelm Friedrich Hegel and Marcel Proust) borders on gross misrepresentation of their ideas. Nevertheless, for the sake of the following discussion I wish to use their names as a means of identifying four very different ways of responding to artworks with the closest related luminaries that I can find for each outlook. Regarding the first approach, the Aristotelian view is underpinned by the notion that there are archetypal essences that sensitive viewers have developed an understanding about, such as “the ‘pieness’ of pies, the ‘cliffness’ of cliffs” (Arthur, John 1989, Spirit of Place: contemporary Landscape Painting and the American Tradition, Bulfinch Press, Canada, p. 63). This way of looking and the mindset driving it allows a viewer to see through superficial issues with the artwork. For example, the viewer may be conscious of but can overlook issues like surface grime and physical damage to the artwork and technical issues to do with composition, proportions and handling of the medium employed. In spite of being conscious of such concerns, however, they are backgrounded by the viewer’s desire to envisage what the artwork aspires to project. 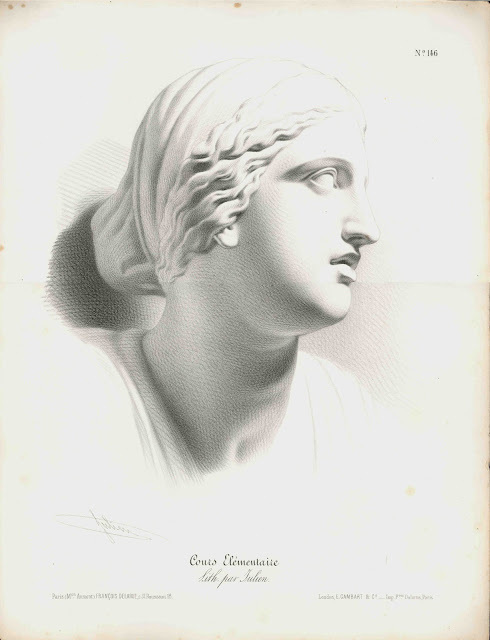 To explain this with a practical example, in Bernard-Romain Julien’s (1802–71) lithograph, Etude aux deux crayons N°15 (shown below), there are traces that the print has been handled over the centuries and there is clear evidence of that it has undergone a minor misadventure in its past life as one corner is chipped. To viewers with an Aristotelian eye, such issues are not overly significant. 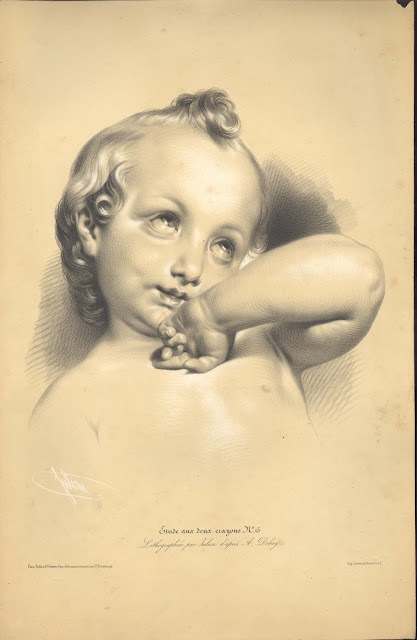 Instead, their gaze is more focused on what the print signifies and to my eyes this is a young girl’s awkward but cloyingly charming moment of innocence. 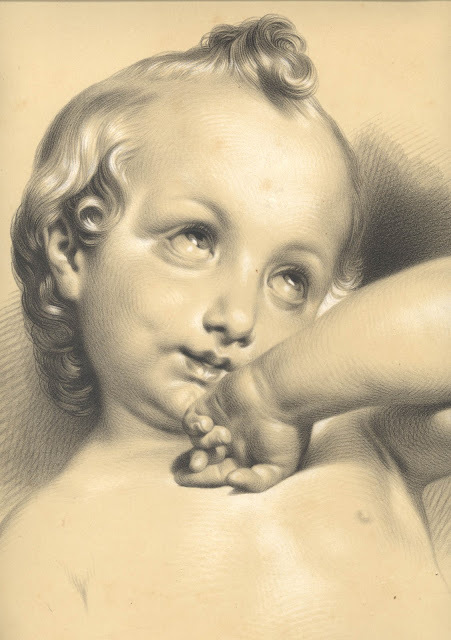 From such a Aristotelian viewpoint, the featured subject is not a portrait of particular child but rather it is an embodiment of the ideal of young girl’s sweetness. Going further, the highly refined rendering of tone (i.e. the treatment of light and shade) modelling her features is pictorially cleansed of incidental details (e.g. freckles, blemishes and physiological abnormalities) presents an idealised vision of how little girls should look lik­e—albeit a saccharinely sweet vision. 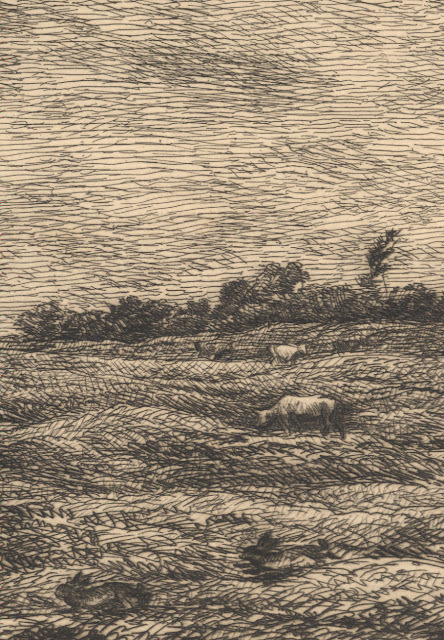 Condition: strong impression with light surface soiling, faint scattered foxing and the top right corner chipped. I am selling this print for a total cost of $95 AUD including postage and handling to anywhere in the world. This is a large print and will be posted in a tube. Please contact me using the email link at the top of the page if you have any queries or click the “Buy Now” button below. The second way that viewers can look at an artwork, the Kantian view, proposes that the viewer can read the artwork like Sherlock Holmes and reconstruct from the evidence displayed the inner workings of the artist’s mind. With this mindset the viewer’s whole engagement with the artwork is to decipher the reasons for the artist’s choice, arrangement and manner of the execution of the portrayed subject material. In essence the viewer is absorbed with experiencing the artist’s presence projected by the artwork. 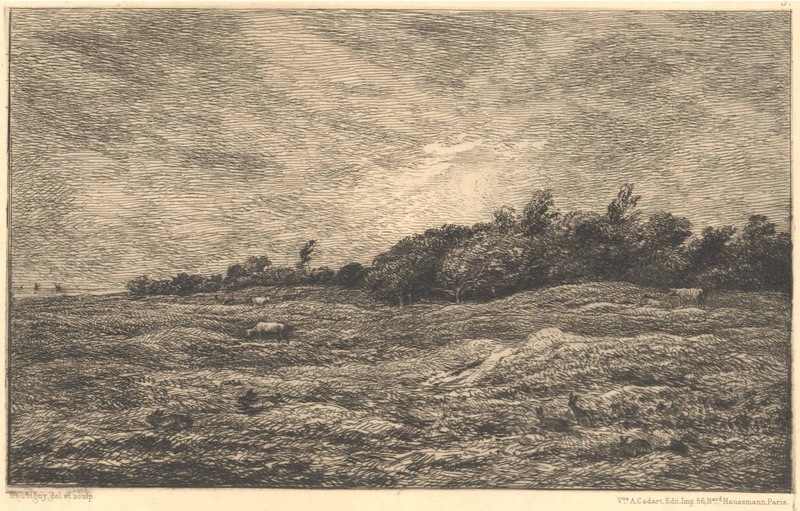 For example, in Charles François Daubigny’s (1817–1878) etching, Le Pre Des Graves a Villerville (Calvados) [Grazing Cows in a Meadow near Villerville] (shown below), the viewer may be captivated with finding the three cows and five rabbits—there may be more of both animals but these are the ones that I can see—that Daubigny has woven into the pictorial fabric of the grasslands. 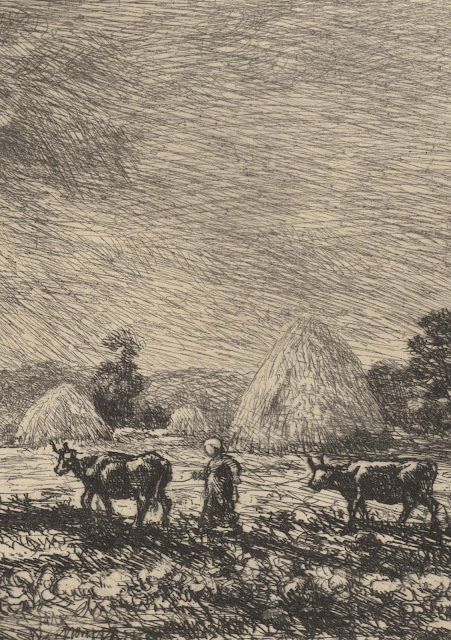 The viewer could also contemplate why Daubigny chose to draw this particular scene and enter into the artist’s thought processes (i.e. “head space”) to unravel its significance. 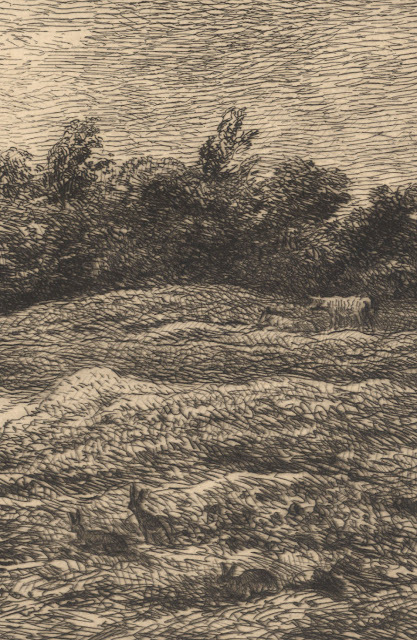 From a personal viewpoint, for instance, I see this landscape with its finely hatched linear treatment as being like the undulating hairy skin of an animal. Moreover, my reading of the image is that Daubigny expresses an animist view of landscape in the sense of conceiving of it as a spiritually alive entity. Inscribed: “3.” (upper right); “Daubigny del et sculp.” (lower left); “Vve A. Cadart. Edit. Imp. 56 Bard Haussmann, Paris.” (lower right); “LE PRE DES GRAVES A VILLERVILLE (Calvados)” (lower centre). Condition: excellent impression in very good condition. 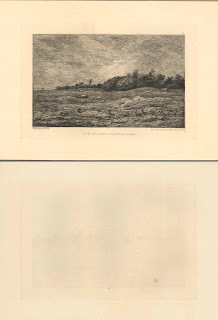 There is a small mark (approximately .5 cm square) on the back of the print that is not visible in the image on the front. I am selling this print for a total cost of $160 AUD including postage and handling to anywhere in the world. Please contact me using the email link at the top of the page if you have any queries or click the “Buy Now” button below. 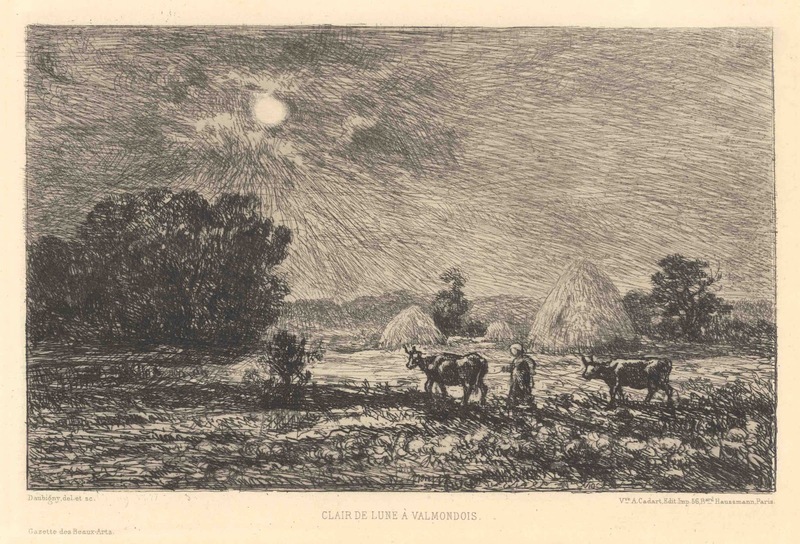 As an example of the Shillerian view I wish to focus on Daubigny’s Claire De Lune a Valmondois (shown below) which is the last etching he executed. In this print the dim light of early evening makes the moon glowing above the tree line appear like the sun as it casts soft radiating shadows from the farmer leading his (or her) cows home. From my reading of this image the figure and cows are arranged at the intersection of dark and light to signify a shift from day to night. Going further, for me this intersection is a metaphor for a change in energy from daytime labours to night-time relaxation. When I look at the print I literally feel a calming shift in my energy level. In short, this way of looking at the print is all about recognising a duality of feelings and responding to the manner in which they are brought together. Inscribed: “Daubigny del et sculp.” (lower left); “Vve A. Cadart. Edit. Imp. 56 Bard Haussmann, Paris.” (lower right); “LE PRE DES GRAVES A VILLERVILLE (Calvados)” (lower centre); “Gazette des Beaux Arts” (bottom left). The fourth way of looking the artwork, the Hegelian view, is about finding beauty in an artwork as a point of departure for spiritual transcendence. 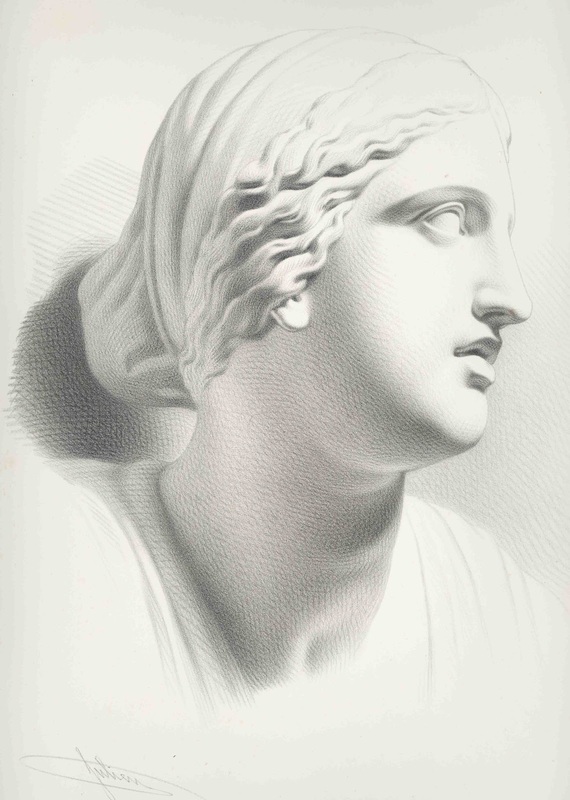 What constitutes this notion of beauty, of course, is, as Margaret Wolfe Hungerford correctly advises, “in the eye of the beholder.” Some artworks, however, are executed with the idea that they will be seen to be beautiful. For example, Bernard-Romain Julien’s lithograph Cours Elementaire, Plate N°15 (shown below), executed to epitomise classical ideals of beauty and designed to excite art students to replicate it. 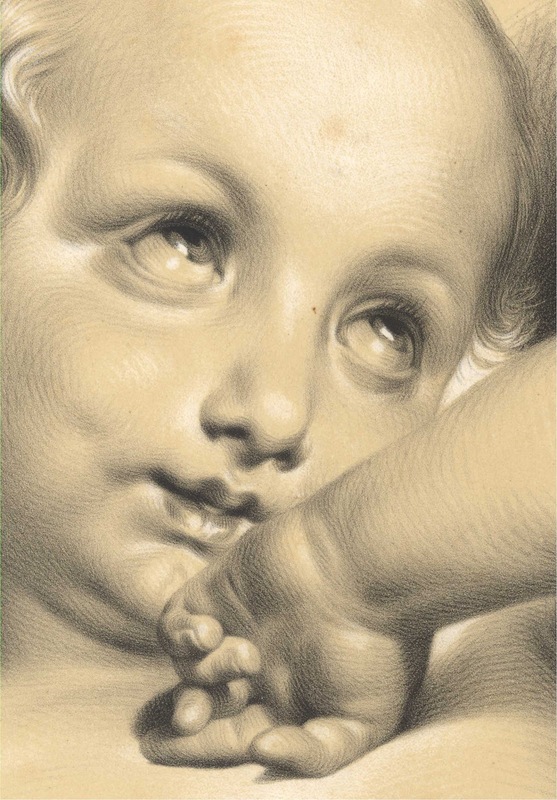 Whether such an image is still likely to be a “point of departure for spiritual transcendence” is an open question. Nevertheless, this is a fine example of an artwork designed for such a purpose. I am selling this print for a total cost of $65 AUD including postage and handling to anywhere in the world. This print will be posted in a tube. Please contact me using the email link at the top of the page if you have any queries or click the “Buy Now” button below. Explaining the fifth way that a viewer may look at, or more correctly respond to, an artwork (i.e. a Proustian experience) is a little more complex than the previous four. The essential construct in this approach is that the reading of imagery is less about the artist who created it and more about the viewer using—perhaps subverting—the projected meanings of the artwork for personal satisfactions (i.e. self-indulgent pleasures). 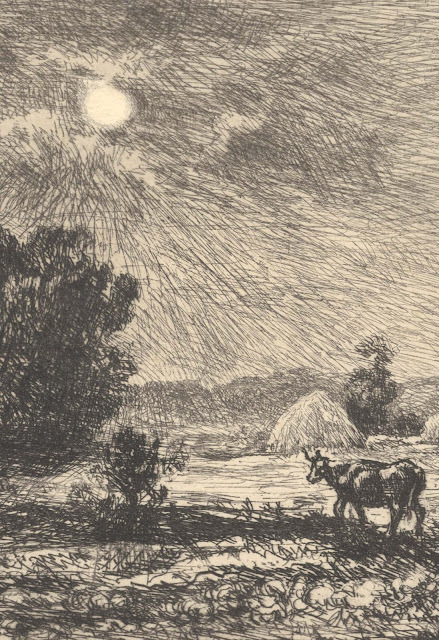 One such “satisfaction” may be a flood of recollections prompted by the artwork. This occurs where a feature of the artwork excites memories and so the artwork is like a launch pad in raising distant memories and experiences. Another “satisfaction” may be involuntary aesthetic critiquing. This occurs when a viewer’s mind is triggered by some feature of the artwork into benchmarking the artwork against a personal set of aesthetic values and sensitivities. In this overwhelming aesthetic critique the viewer may even engage in mentally correcting the perceived shortfalls in the artwork in what is euphemistically described as “the mind’s eye.” The final “satisfaction” I will discuss is to view the artwork as a focus for contemplation in the way that Matisse famously describes as ‘something like a good armchair which provides relaxation from physical fatigue” (Matisse, Henri 1908 “Notes d’un Peintre” in La Grande Revue as translated by Jack Flam  in Matisse on Art). Here the artwork passes from being examined as an artefact to being a visual field for reverie. 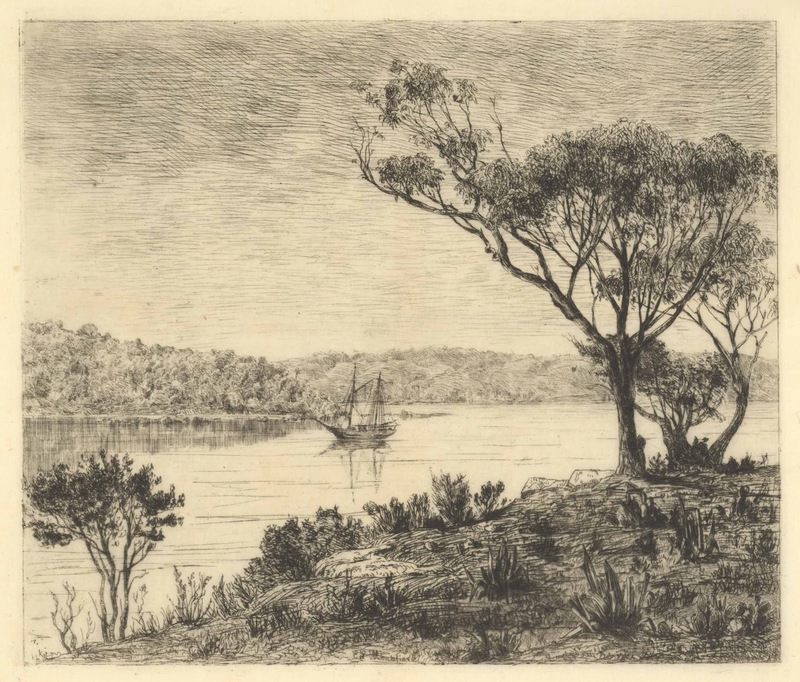 As an example of how the view of an artwork can move from artefact to reverie I will use Edouard Levy Montefiore’s (1820–94) etching, Vue Dans Le Port De Sydney (Australie) (shown below). 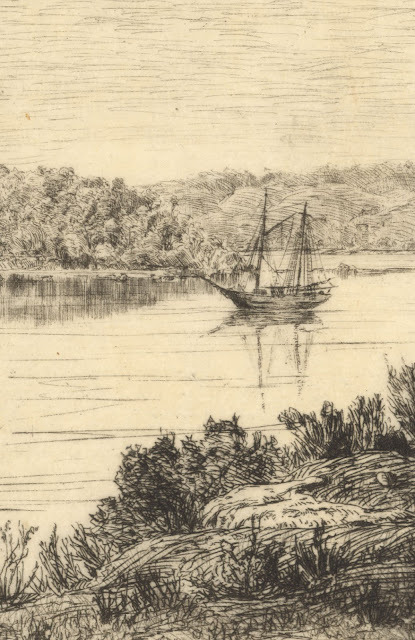 Clearly this is an early view of Sydney harbour but for anyone familiar with the Sydney the image is a challenge to look at without the mind lapsing into thoughts about how the portrayed waterfront has changed. This effect of the mind wishing to intervene with an involuntary flood of memories—in this case very recent ones—exemplifies this final viewer response when looking at an artwork. Condition: a rare and strong impression on very thin paper in very good condition. 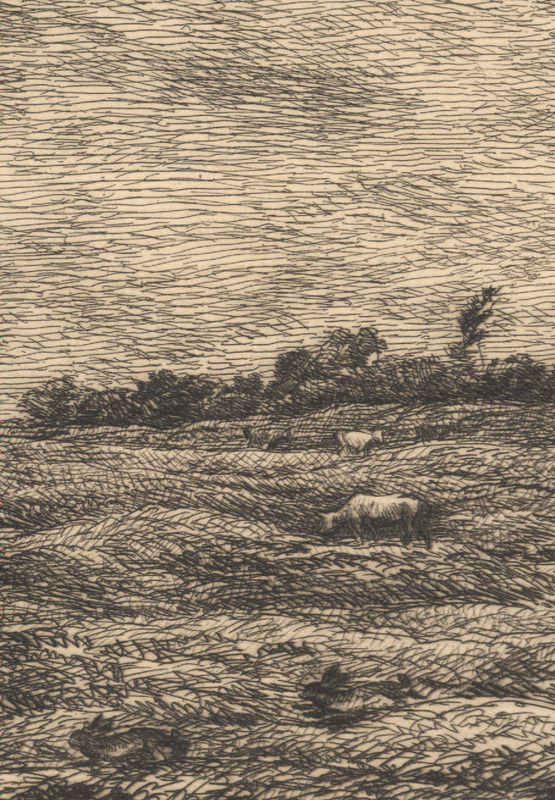 There is a pencil inscription of title and the artist’s name on the lower edge of sheet. I am selling this print for a total cost of $210 AUD including postage and handling to anywhere in the world. Please contact me using the email link at the top of the page if you have any queries or click the “Buy Now” button below.